Writing is a great form of medicine when it comes to dealing with all the emotions that you may be going through in your life. It may help save your life and even the lives of others who may be going through, or have gone through already, similar situations or experiences. It is also a great way to document your experiences and things you've been through - whether they are bad or good. You can think of writing as a snapshot of the past, present, and future that you paint with the words of your heart, mind, and soul. You can think of it as a written photo album of your life that will only continue to grow as the days go by. There are many ways to capture all you've been through, are going through at the moment, and may go through in the days ahead. You can write blogs, prose, and other non-fiction pieces. But you can also turn to a more creative medium and write poetry and lyrics instead. Writing poetry and lyrics is not only a lot of fun and very creative, but it may be the best way to pour out your heart and soul - not just for yourself but for others as well. The poems you create may become everlasting works of art that others will connect to and turn to time and time again. The lyrics that you bring to life may turn into songs that will not only move people in many different ways but will also be those that people will not be able to get out of their heads. I am a writer and I love writing poetry and lyrics the most. I have gotten a lot of positive feedback for my writing over the years. People have told me that they connect to what I write, that they see themselves within the lines that fill the pages, that they are moved and inspired by the words of my heart. That is the feedback that I will cherish forever. That is one of the reasons why I write, and why poetry and lyrics are the main focus. It is a huge passion of mine that only continues to grow. That is also the reason why I have published and will continue to publish books in the future. I have published six books to-date - Pieces of Me (poetry), Soundtrack of My Life: Volume 1 (lyrics), Soundtrack of My Life: Volume 2 (lyrics), Diary of a Crush (poetry, lyrics, prose), Treasure (poetic tale), and Melodies of the Heart (lyrics). I am very proud of these books and am thrilled that they are there for people to both enjoy, connect with, and get something out of. I love touching people's lives. I love when they connect to my writing. I love when I am able to help them in some way and inspire them through my words. Knowing this makes it all worth while and moves me beyond words. Below is one of my original lyrics. It inspires people and gives them the confidence to turn their lives around if they are not happy with the way things are going for them. It instills them with hope that everything will be okay even though it may not have been in the past. It lets them know that sometimes they just have to start over and take that first step even though they may be scared to go for it. Whenever I read this lyric it affects me the same way and the people that have read this lyric give me similar feedback. Well expressed, Lena... ...both your essay and the poem that very effectively complements it. Thank you for sharing. Love, best wishes, and continued success in your writing... ...Regis. Lena ~ enjoyed both your Article and the Song. 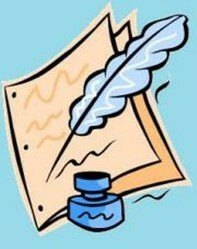 Writing is a great way to express one self; writing saved my life as a child, growing up abused. That's why I started to write when I was young, age 8. Thank you for sharing this. I really got a lot out of it and I agree that expressing our emotions is not only rewarding, but therapeutic.